Complete set of 12 full-page woodcuts. Watermarks ‘triangle with flower’ and ‘tower and crown’. Woodcuts c. 395 x 275 mm. Along with the Apocalypse and the Life of the Virgin, this work belongs to the so-called ‘Three Large Books’ by Albrecht Dürer (Nuremberg 1471-1528). The text is by Benedictus Chelidonius from the monastery of St. Egidius/St. Giles in Nuremberg. Closely associated with the humanist circle around Willibald Pirckheimer, Chelidonius wrote his Passion of Christ in the form of a classical illustrated poem composed in hexameters. The majestic cycle was created in two stages: seven undated cuts from the years 1496-1499 were – like those of the Apocalypse – sold individually. In 1510, Dürer completed it with four more scenes and eventually published the book as a whole in 1511. 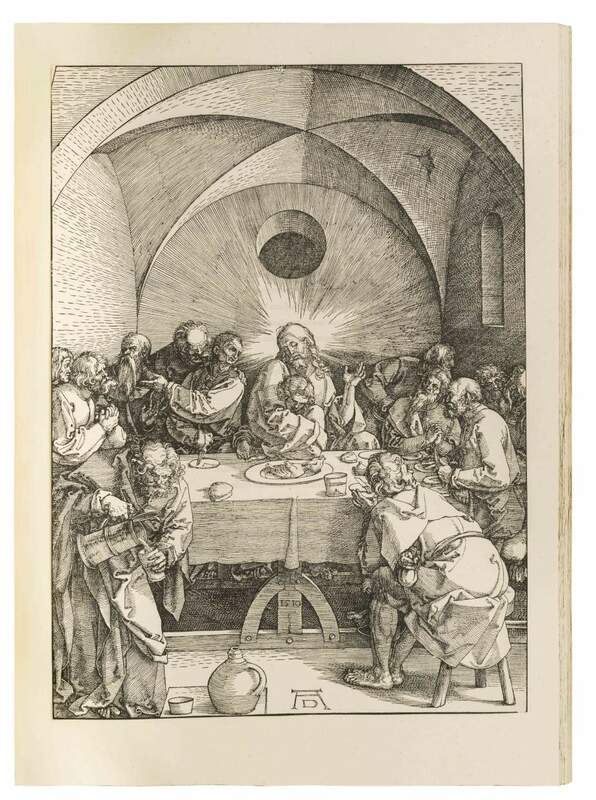 With this woodcut series, Dürer shaped the image of Christ’s Passion for centuries. In contrast to his panel paintings, he remained independent of the will of patrons in his graphic works and was thus able to give free course to his imagination. Searching for a ‘scientific’ image of Man throughout his life, he used his graphic cycles to emphasise fundamental human experiences. In this pursuit, he was a pioneer and an innovator. The circulation of his graphic works must have produced an incredible impact on the society of the time that was unfamiliar with such optical impressions.